Sudden, very severe eruptions of nodules and cysts on the face, chest and back have to be dealt with on an emergency basis as these are potentially deep scar forming conditions. Nodulocystic acne is the very severe grade 4 acne consisting of deep seated fluctuant nodules and cysts and numerous pus filled bumps. Most of the face, front of chest and back is commonly involved in nodulocystic acne. How is Nodulocystic Acne Formed? ia P.acnes causes stretching and weakening of the wall of the sebaceous gland and hair follicle. This leads to rupture of the contents in to the dermis. A severe foreign body reaction takes place and the whole inflammatory debris and cells are segregated into fluctuant nodules and cysts deep within the dermis. 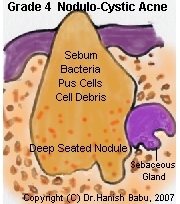 Thus is formed the nodulocystic acne. What is the Best Treatment for the Very Severe Nodulocystic Acne? The best treatment for the very severe type of nodulocystic acne includes drainage of the pus, intralesional steroids, and oral isotretinoin. Isotretinoin gives very good results in this type of very severe acne, but its toxicity reduces its appeal to many patients. It is absolutely contraindicated in pregnancy. The second line of treatment involves use of minocycline in place of isotretinoin. Other principles of treatment of acne also have to be observed in the case of nodulocystic acne. Avoiding acne triggers is also an important part of the management of nodulocystic acne. What are the Complications of Very Severe Pimples? The nodules and cysts in the very severe type of pimples are situated deep within the dermis and when they heal, leave depressed, deep scars. Chances of hypertrophic scars are also high and in those with keloidal tendency, these will form disfiguring keloidal scars. Immediate institution of isotretinoin and other measures help reduce the severity of scarring in nodulocystic acne. The main side effect of isotretinoin is the teratogenic effect on the fetus. Because of the risk of deformities, women should take care that they do not become pregnant during and two months after the course of isotretinoin. Most other side effects of isotretinoin in acne are related to the extreme dryness caused by the medication. What are the Other Different Types of Very Severe Acne? In addition to the nodulocystic acne, acne conglobata, pyoderma faciale and acne fulminans are the most severe types of pimples that are seen in patients. Acne conglobata runs a chronic course with involved areas of the face and trunk filled with communicating cysts, abscesses and draining sinuses. The healing is with hypertrophic and atrophic scars. Recurrent episodes of joint inflammation may also be present in some patients. Treatment is similar to nodulocystic acne. Pyoderma faciale commonly affects females and presents with an explosive eruption of large, tender, red cysts, mainly in the central part of the face. Spontaneous purulent discharge is present from the cysts. Comedones are conspicuous by their absence in this type of acne. Treatment is with drainage, oral isotretinoin and systemic steroids. In fact this is one of the rarer forms of acne where a short course of systemic steroids can bring fast relief to the patient. Acne fulminans is a rare, ulcerative type of acne that mainly affects young adolescent males. There is an abrupt eruption of inflamed, necrotic acne leaving superficial and deep ulcers on the skin surface. Associated systemic symptoms of fever, weight loss, muscle and joint pains give the patient a toxic and weak appearance. Treatment is similar to pyoderma faciale. Nodulocystic acne and other types of very severe types of acne are dermatological emergencies which need to be treated aggressively in early stages to avoid permanent deep scars.